After Clegg: Who will lead Liberal Democrats out of political wilderness? 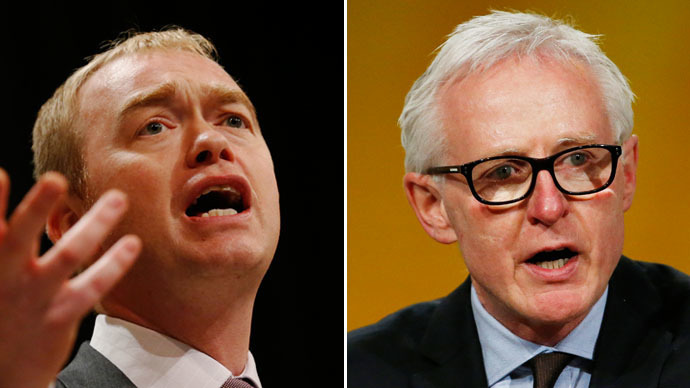 Following their devastating election trouncing and the resignation of former-Deputy Prime Minister Nick Clegg, the leadership contest for the Liberal Democrat party has produced two front runners. First to throw his hat into the ring was former Health Minister Norman Lamb, who announced on Monday he intends to run for the position. He is likely to face former party President Tim Farron, who’s been heralded as a contender for a number of months, but hasn’t officially revealed any intentions to contest the leadership. Lamb, who kept his seat with a reduced majority of 4,043, told the BBC he had “never shrunk away from a challenge,” adding that confidence in the party had been “undermined” by the U-turn in its tuition fee policy. Farron and Lamb are two of only eight MPs left after the party suffered a humiliating cull on polling day, which Lamb described as “absolutely punishing.” A ballot to determine the new party leader is not expected to be finalized until July. He claimed he had taken the decision after “an awful lot” of soul-searching, but said he would stand as “obviously the party suffered devastating results last Thursday. It’s critically important that we reconnect and ... have an effective advocate for what modern liberalism is all about. “As health minister I put body and soul into it and I would do the same for this job. “Trust for me is critically important and [the tuition fees] debacle massively undermined people’s trust in the party,” Lamb said. Farron has so far avoided any public declaration of his intentions. Speaking in his constituency on Monday he told the Westmorland Gazette he would only run for leader if his constituents agreed with the decision. “There is no question [that] if I felt the local people didn't want me to do it, I wouldn't do it,” he said. “And that doesn't mean I will definitely do it because people have said very lovely things to me over the weekend, but it does help to inform the decision. Farron, whose majority fell from 12,264 to 8,949, added he would be excited to be a part of the party’s rejuvenation process. “There are thousands of new members in the country who have thrown their weight behind us and they are going to be part of that rebuild and I am excited to be part of that. It was revealed on Tuesday that if Farron was to secure the leadership, he would drop the ‘Democrats’ fragment of the party’s name, reverting to the historical title of ‘Liberals’. “The Liberal party has a long history and it is important to capitalize on that. We are the party of Gladstone, Lloyd George and Beveridge, and we should be proud of that,” a source told the Telegraph. Nominations for leader of the party will open on May 13 and close on June 3. Ballot papers will then be sent out on June 24. The winner is expected to be announced on July 16.